Registration & participation is totally free and encouraged. Only registered Bookerville members can add new topics and post replies. Use your same Member Name that you use to manage your properties. No obligation to use Bookerville's online booking software. Help the Bookerville Community decide on new features, report bugs, get help with integrating Bookerville into your web pages, and more! By clicking Sign Me Up, you accept the Terms and Conditions. The forums are categorical so we can keep our topics organized. Let's face it: sometimes it's just easier to plug in some terms and see what Google finds for you! Before we get into the good news, let's briefly review what Bookerville's Auto-Responder is. Whenever you get an inquiry from a listing site (such as Homeaway, VRBO, FlipKey, AirBnB, etc.) they usually send an email to you with the details. 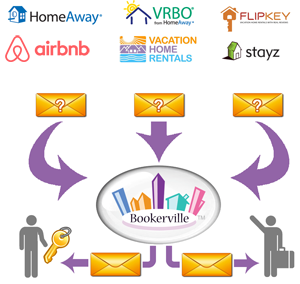 You can automatically forward a copy of these emails to a special email address at Bookerville, and Bookerville will read those emails, obtain the information in them, and potentially automatically generate replies to the guests with quotes, links to book, see your other properties, or make online booking requests. This is configurable, and there are lots of options on how to run it. At a minimum, Bookerville records all these inquiries and presents them to you for easy administering in a convenient lead-management tool in your Dashboard » At-A-Glance tab. You can learn more about our highly-acclaimed Auto-Responder and what it can do for you. Our recent experience with our customers has revealed that Homeaway's policies provide for a workaround: if you explain to them that you are using an Auto-Responder, they will put the guest email addresses back into your inquiry emails. We've seen them do this for several of our customers, large and small. So it's certainly worth reaching out to your account representative to ask about this, as it appears they are willing to cooperate. And while you have their attention, it's certainly also worth telling them that you want them to open up their API's to Bookerville so that we can integrate availability data, keeping your calendars synchronized automatically. AirBnB, FlipKey, and many other listing sites already do this using our iCal export feature, so it's about time Homeaway and VRBO make your life as easy as those other listing sites do, right? Seems they force it to 320 pixels, which is incredibly narrow. I can't fathom why they would force it to such a small size, given that no phones have been produced for almost 10 years with less than double that (640 pixel) resolution. I don't know how old that page is, so hopefully (?) it's no longer true, but if it is, then it might mean you need to move on from Wix and find a more modern solution that has more reasonable viewport options. That is a good point. And I can see how most managers likely have one crew or company do all the cleans for a single property. As we've brought the housekeeping 'in house' so to speak, we'd ideally have the flexibility to assign a clean to a housekeeper because of their scheduling preferences. For instance, we have one duo of cleaners that can only do weekday cleans if they are not a 'back to back' because of other commitments. In that case we'd assign just those cleans to another team. Presently, we print a screen grab of the Bookerville Master Calendar for our next months bookings and just mark up the cleans with symbols indicating each of the crews. Then we send an e-mail to each crew with their schedule for that month and keep the hard copy pinned up in the office for reference or last min changes. If we could assign the booking/clean to a housekeeper, then perhaps they could use the clean/inspect app feature without seeing the master calendar showing every booking for every property they've been given permission to view via settings. Maybe the ability to assign bookings to members could be a setting that could be turned on and off via the property's page? Not sure if or how that would complicate the software's other functions. Just a thought. Like said we're getting by just fine for now, but it might be a useful feature to consider. It's been considered before, but the trouble is that it leaves you having to manually assign cleaners like, constantly. Once most managers realize that, they seem to balk at it. But is that how you operate?